Xterra Fitness is one of those companies that you don't often hear about, but has a very respectable line of cardio equipment, including treadmills, ellipticals, rowing machines, steppers, and of course exercise bikes. They have a strong commitment to quality, and it shows in the craftsmanship and durability of their machines. And the best part is they keep everything very affordable...so you don't have to pay an arm and a leg to get a solid exercise bike. Xterra Fitness is headquartered in Jonesboro, Arkansas, and has been in business for about 30 years. They are a subsidiary of Dyaco, an international corporation that also sells cardio equipment under the Spirit and Sole Fitness labels. They are slowly making inroads in the home gym niche, although competition in this price range is steep and dominated by companies like NordicTrack and ProForm. Time will tell if they will be able to make further progress and become a household name. But for now things are looking good. 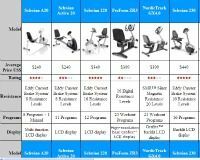 As of our latest review there are only three Xterra exercise bikes to choose from: the MBX2500, MB550 and the SB500. There's also the FB150 Folding Exercise Bike, but that is a very basic $100 bike that they sometimes give away as a free gift with purchase. 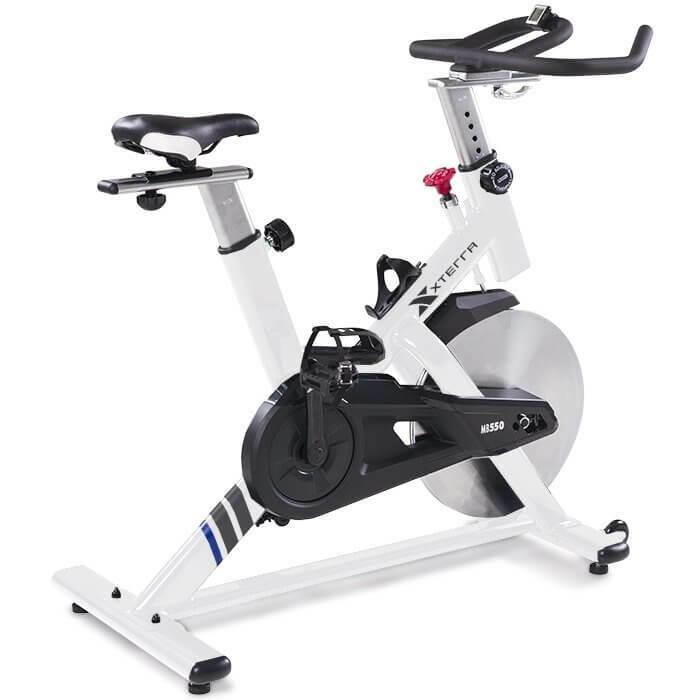 The most affordable model in the series is the MBX2500, a rear wheel indoor cycle. It is a sleek and durable bike with a heavy-duty steel frame, offering up to 8 resistance levels, belt drive, a basic LCD display and a 48.5 lb. flywheel. You get plenty of adjustability and the bike can accommodate up to 300 lbs. It comes with a very strong warranty: lifetime frame and 1 year parts, brake and labor. Moving up in the lineup you have another indoor cycle, the MB550. This one has the more traditional front wheel design. 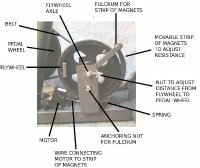 Besides the configuration of the flywheel and the wireless LCD display, the MB550 and the MBX2500 are very similar, with equal adjustability, flywheel weight and warranty. Interestingly the MB550 has a lower max weight capacity even though it is a heavier bike. The most expensive bike in the lineup isn't an indoor cycle like the other two, but rather a recumbent bike. There is no upright bike in the series for some reason. Here you get a heavy duty, walk through frame, with a large 6.5" LCD frame, wireless and grip heart rate monitoring capability, 7 built in workout programs plus manual, 20 resistance levels and a stronger 3 years parts warranty. How Do the Xterra Bikes Compare to the Competition? The Xterra bikes range in price from about $499 to $799 when they are on sale, so they compete with the other sort of low to mid priced brands, including Schwinn Fitness, Nautilus, their sister company Sole, as well as NordicTrack and ProForm. So there's a lot of competition out there as we mentioned. Xterra exercise bikes do stand out in some regards though, making them a very good option for the home gym. For starters, their warranties are rock solid, just Sole Fitness's are. So right there that separates them from companies that offer less than ideal coverage like Schwinn and Nautilus. The SB500 has a heavier flywheel than ProForm's 440ES, although it has a lower max weight capacity and less interactive programming. The full Xterra lineup is more affordable than NordicTrack's for the most part, so if budget is an issue Xterra will be a better option. Overall, making an apples to apples comparison Xterra has some benefits and drawbacks, so it's a matter of looking closely at the specs and determining which bike makes the most sense for you. Are Xterra Bikes Worth Buying? If you're in the market for an affordable exercise bike for your home, Xterra is certainly worth considering. They are very well priced and well built, and are backed by very strong warranties as well as a money back guarantee...and no tax in some cases! 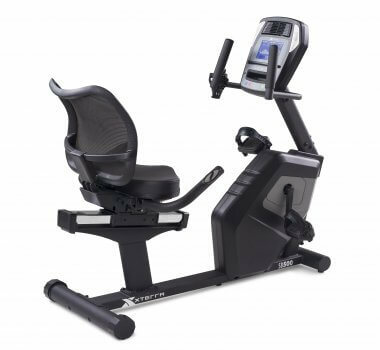 Again, they don't have a traditional upright bike option, and they aren't packed with a ton of features like NordicTrack and ProForm, but if you can find what you are looking for you won't be dissatisfied.